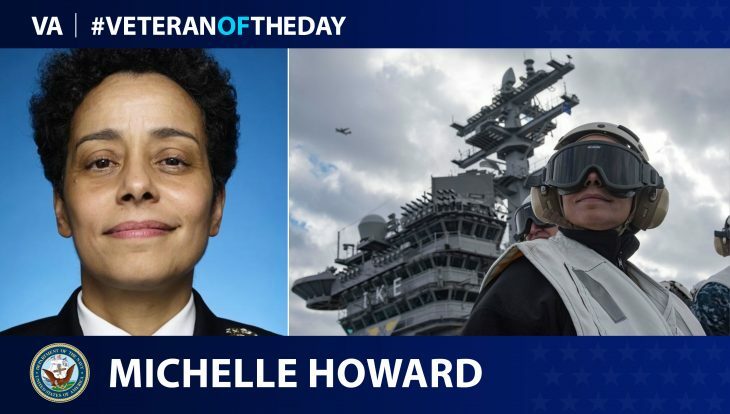 Today’s #VeteranOfTheDay is Navy Veteran Michelle Howard. Michelle served during the Gulf War from 1982 to 2017. Michelle was born at the March Air Force Base, California on April 1960. She graduated Gateway High School during the summer of 1978 and graduated from the U.S. Naval Academy with a Bachelors of Science on 1982. Upon graduation, she was commissioned into the Navy and was stationed aboard the USS Hunley and USS Lexington. She was awarded the Winifred Collins award for her outstanding leadership aboard the UUS Lexington on 1987. Then, she was assigned as the Chief Engineer of the USS Mount Hood on 1990 and deployed in support of Operation Desert Shield and Desert Storm. Michelle then assumed the duties of first lieutenant of USS Flint on 1992 and in 1996, became the Executive Officer of USS Tortuga and deployed in support of Operation Joint Endeavor. She entered the Army Command and General Staff College in 1998 and earned a Master’s degree in Military Arts and Sciences. In 1999, she took command of the USS Rushmore and became the first African American woman to command a ship. Michelle then took command of the Amphibious Squadron 7 and aided in the relief in the aftermath of the Indian Ocean tsunami of 2004. Michelle was promoted to rear admiral in 2007 and subsequently became the senior military assistant to the Secretary of the Navy from 2007 to 2009. Then she took leadership of the Expeditionary Strike Group Two and guarded the Persian Gulf in support of the war on terrorism. Under her command, her sailors rescued Richard Phillips and his crew from Somali pirates who held them hostage. She was promoted to the rank of admiral in 2014 and took command of the U.S. Naval Forces Europe-Africa and NATO Allied Force Joint Command becoming the first woman and African American to command a joint billet. For her service, Michelle has earned various awards and decorations including the Navy Distinguished Service Medal, Navy Achievement Medal, Joint Meritorious Unit Award, Defense Superior Service Medal, Legion of Merit, and numerous other medals. She has also earned multiple distinctions during her time in service to include being named the Women of Color (STEM) Career Achievement 2008, NAACP Chairman’s Image Award 2013, French Legion of Honor 2015, and Order of Naval merit Brazil 2017. She also earned three honorary degrees from Rensselaer Polytechnic Institute, American Public University, and North Caroline State University. She is currently an associate professor at George Washington University. Thank you for your service, Michelle! Graphic by Emma Catlett. Emma is a sophomore at Baylor University and is studying Political Science with a French minor and Pre-Law concentration. Admiral Howard! Thank you for your continued leadership and service. Go SAJM! Thank you for your service Navy Veteran Michelle Howard.